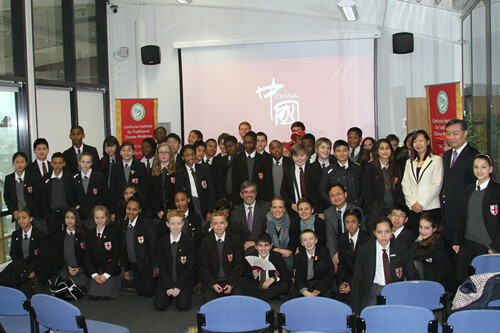 On 26 November, the Chinese Embassy and the Confucius Institute for Traditional Chinese Medicine at London South Bank University (LSBU) held a colourful and original event called “China Day” for more than 60 teachers and students from St George’s School. Prof. Paul Ivey, Pro-Vice-Chancellor of LSBU, and Mr. Zhang Jiming, Minister Counsellor of Chinese Embassy, delivered speeches. Designed around the glorious history, current robust development and rich cultural heritage of China, the event drew enormous enthusiasm from the students. The first part of the event was a private view of the exhibition “Ming: 50 years that changed China” at the British Museum. The teachers and students were able to get a glimpse the prosperity of the Ming Dynasty in the early 15th century and appreciate China’s peaceful global and cultural outreach during that period. Part II focused on China’s contemporary development. The group arrived at the Confucius Institute for an informative discussion, including Q&A, with Minister Counsellor Zhang Jiming, Counsellor Miao Deyu and other diplomats from the Embassy on the national conditions of China and the “China Dream” that emphasizes peaceful development and win-win cooperation. The event wound up with a series of interactive cultural activities. 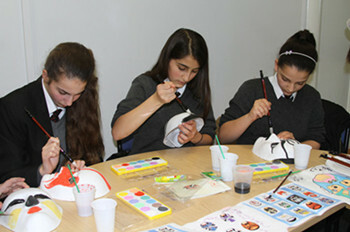 With the help from teachers of the Confucius Institute, the group tried Chinese martial arts and folk dance, made paper-cut, painted opera masks, and wrote and painted with Chinese writing brush. The students showed enormous enthusiasm in the process. In a special dialogue between Chinese and western music, Chinese and British students from St George’s School also performed famous pieces “Birds Singing in the Mountains” on the erhu and “Bach Partita No.3 en la mineur” on the violin. The event was a complete success. Students, through their representative, thanked the organizer for giving them a better understanding of China’s national condition and culture after the one-day event, and expressed appreciation to the Embassy and the Confucius Institute for the careful preparation. Miss King, the teacher who led the group, said that the event sowed seeds of culture and friendship among students and inspired their fascination with China. 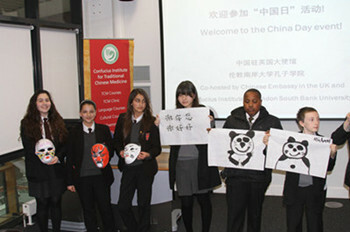 Fully involved in the event, Pro-Vice-Chancellor of LSBU Prof Paul Ivey praised the “China Day” as a once-in-a-lifetime experience that “might change the life path of these children”, and said LSBU and the Confucius Institute for Traditional Chinese Medicine are ready to continue to work for UK-China friendship.